I've been itching for an air combat shooter game that doesn't just look good, but is packed with great speeds and entertaining action. Tons of explosions, bombs and non-stop shooting – that's the time of game I'm after. From the looks of it AirAttack HD should be right down my alley. So let's get down to it and give this game a try! At 41MB, AirAttack HD is one fat baby. Thankfully, the game comes divided into Part 1 and Part 2 which can be downloaded separately onto phones with limited internal storage like the HTC Desire, for example. 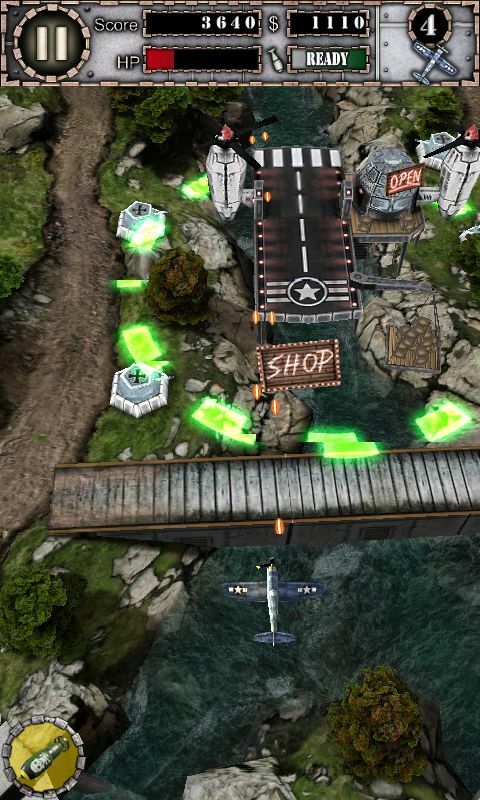 Touch: Control the plane by tapping or dragging your finger across the screen. Relative Touch: Same thing except you can adjust the responsiveness of the plane to your fingertip. Tilt: Control: the game with your phone's tilt sensor. The tilt sensitivity can be adjusted here as well. Joypad: Use a virtual D-Pad that appears on the screen. 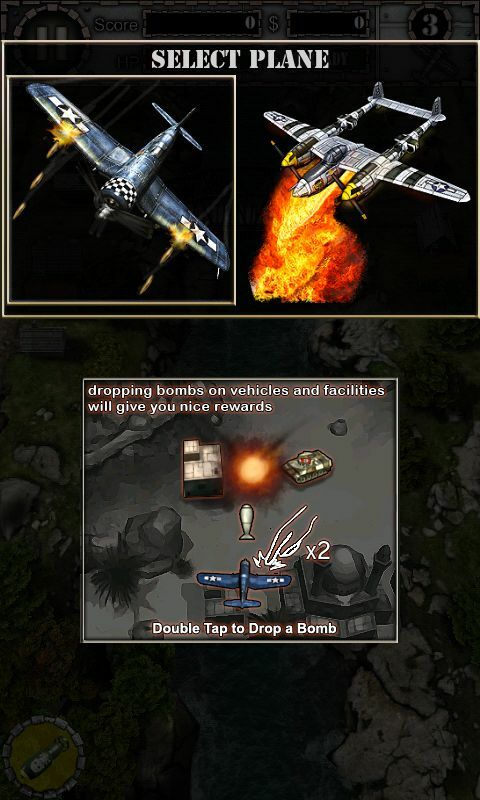 By the way, the plane is in permanent shooting mode and dropping bombs is done by pressing a physical button or double-clicking the screen. 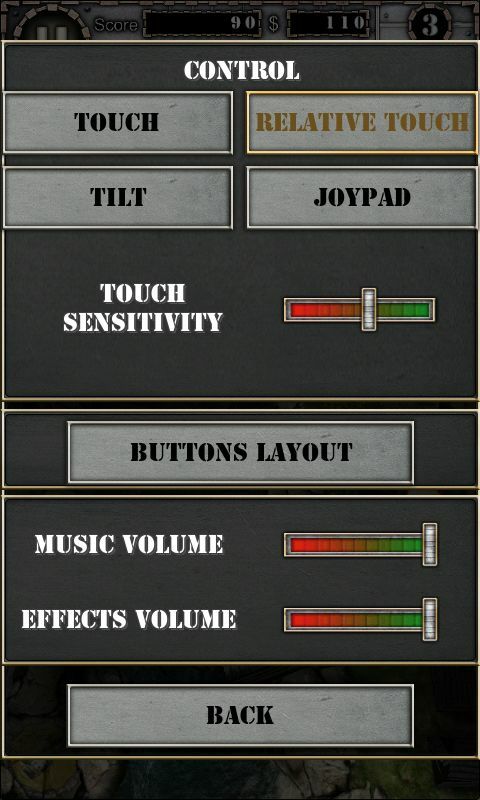 Feel free to change your settings at any point in the game to find the perfect combination for yourself. Personally, I think Relative Touch is the way to go when you're playing on a tablet because it's efficient and you never have the feeling that your finger is blocking your view. For smaller screens, I would recommend sticking to tilt control for the best possible results. 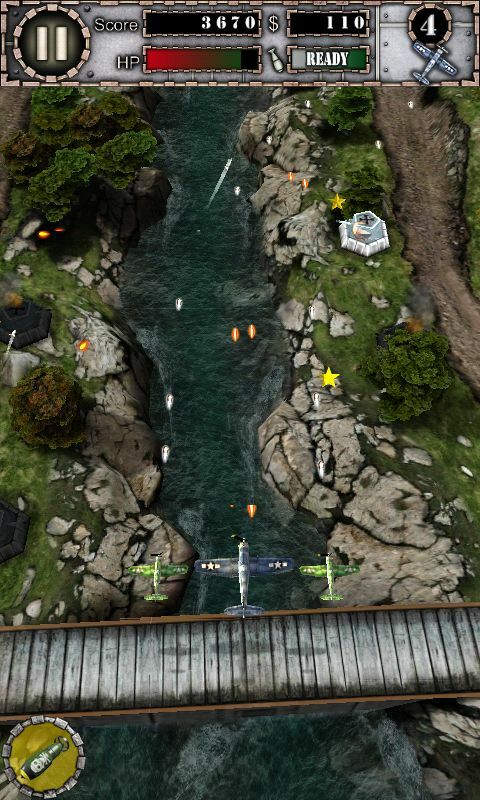 Without giving too much away, let me just assure you that the AirAttack HD graphics are absolutely stunning. On the tablet especially, you can see how much detail and sharpness is packed into each image. 2. Purchase upgrades at a store with money accumulated during the game. By completing certain tasks, new upgrades appear in the store. 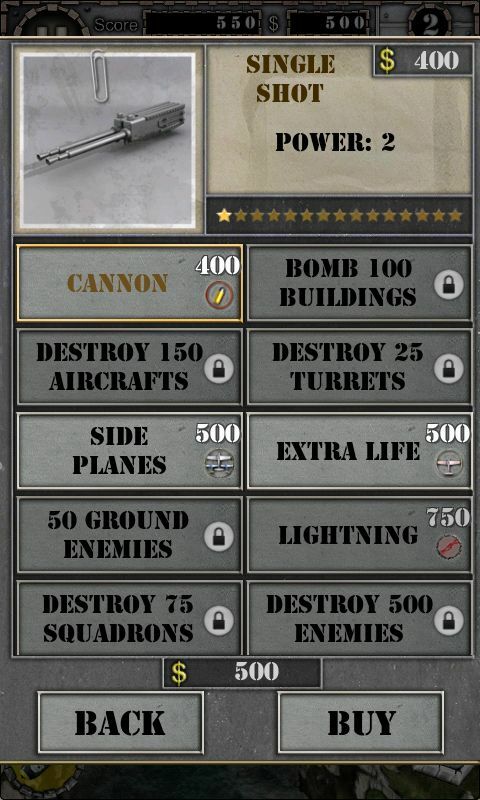 As far your in-game health is concerned, AirAttack HD takes a slightly different approach than other classic shooters such as 1942 where one hit equals immediate death. With AirAttack HD every hit depletes your health bar, but it replenishes itself with time. You also have three lives on top of that. Once it's game over for you, you only lose the latest weapon upgrade and not all of them at once, as is often the case with other shooters. Upgrades aside, you can also earn extra points and cash. Cash can be earned by destroying ground targets such as bridges and buildings. I have to say that I was left with a very positive impression of the game. All my expectations of the game were not only met, but surpassed. The game is challenging, but not too challenging so as to keep you motivated for the long run. AirAttack HD can be controlled – as previously mentioned – with four different types of controls. All of the work really well and it's a matter of preference which one you will actually select. You're always within easy reach of all the most important functions and options. In terms of graphics, the game is a real treat for both the smartphone and tablet. AirAttack HD clocked in a great performance on both the Nexus S and the Galaxy Tab 10.1. Quick response times, no glitches and zero crashed – a set of strong results for an extremely reliable app. 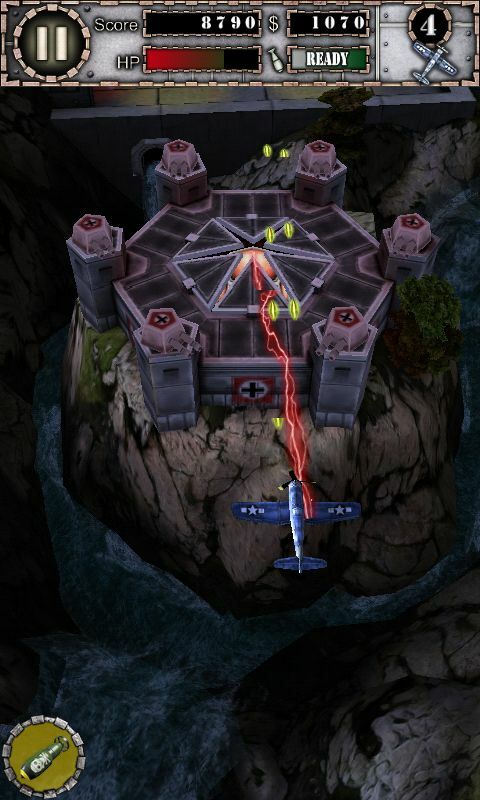 When I think back to the days where I paid 75 cents for a game at the arcade, $3.01 (€2.10) seems like a good price for unlimited fun playing AirAttack HD – available for download directly from our AndroidPIT App Center. More levels are definitely need. Paying 3 bucks for 8 levels is a rip-off. soooo addictive. I need more levels NOW!!! very entertaining, but a bit on the pricey side. don't like this type of game where there is unlimited ammo, but def cool graphics. 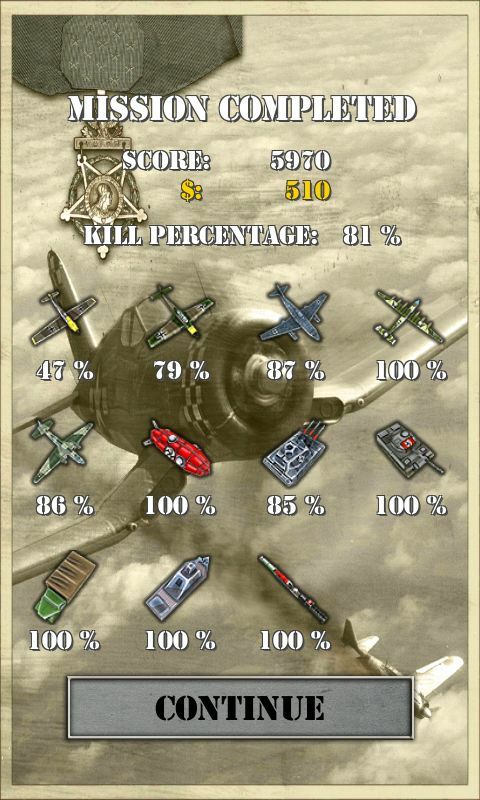 it's 1942 for Android. AWESOME!!!!! !